Maybe it’s a holdover from playing with dolls, but our love for miniatures remains as fierce as the look on Tracey Yee’s face when she caught us giving her Barbies impromptu haircuts. (Ken survived unscathed due to his less-than-tangible follicles.) Less is also more for Philadelphia-based designer Margaux Kent, who decided to downsize her handmade, antique-leather-bound journals to create minuscule tomes you can wear around your neck. 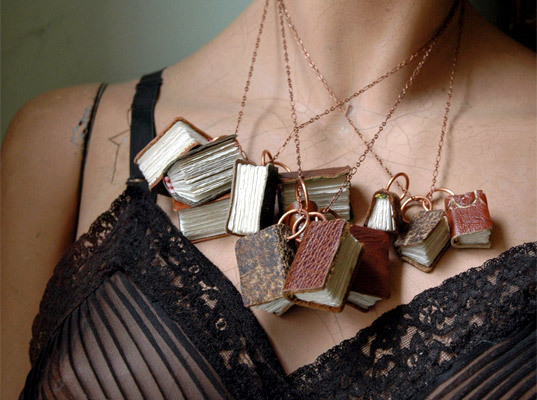 The Lilliputian books are as usable as they are wearable. The little unlined jotters can be flipped open and inscribed the second inspiration strikes—just keep them away from little girls bearing shears. Maybe it's a holdover from playing with dolls, but our love for miniatures remains as fierce as the look on Tracey Yee's face when she caught us giving her Barbies impromptu haircuts. (Ken survived unscathed due to his less-than-tangible follicles.) 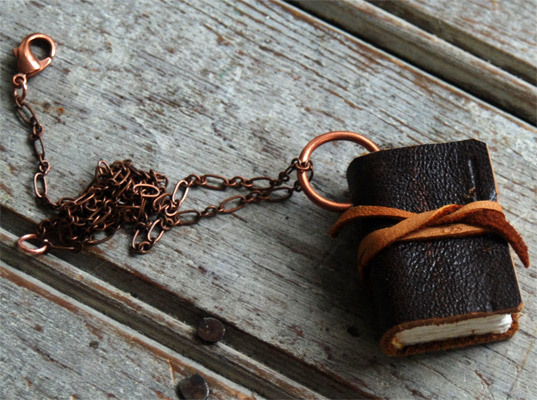 Less is also more for Philadelphia-based designer Margaux Kent, who decided to downsize her handmade, antique-leather-bound journals to create minuscule tomes you can wear around your neck.